A polished app experience is one of the elements that make a great app. These app experiences include depth, simplicity, intuitive rhythm, progression, and delight. As people who not only build but use apps, we sometimes come across work and concepts that inspire us or influence our thinking. By looking at high quality work, we all can be inspired to do high or higher quality work. More generally, there's something to be said about seeing how others in our industry overcome challenges. Whether it’s an app we've downloaded and use ourselves or a concept we’ve seen on Dribbble, here are some of the app experiences we have recently encountered that we consider inspirational. The splash screen animation by NIKITIN TEAM really helps set the tone and style for the rest of the app. The illustration work and animation shows the level of detail that is to come. It’s so visually pleasing that it makes us excited to see more of the app once it launches. Uber’s latest version also has a really fun splash screen that transitions from it’s logo to the current location on the map. While fun, their approach also is a sleight of hand. The Uber app has to identify the user’s location before it can show the map, so this animation serves as a brief, interesting distraction while that occurs. We agree with the assessment of this intro sequence feeling futuristic and awesome. These onboarding illustrations from Ramotion (left) and Adam Nelsen (below) demonstrate great visual techniques to pull users into an app from the get go. Ramotion's illustration work is very clean and minimal, but provides a great contrast between shades. 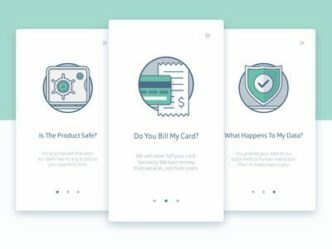 Nelson's onboarding illustrations are stunning in that they show different sceneries that take up the full width of the screen. This sceneries provide a nice immersion into the style of the app. We're a fan of the overall onboarding process by Christophe Kerebel because of how simple it is for users to sign up. What steals the show, however, is the animation between the screens and the marker showing users how far along they are in the process. Hopper— an app focused on when to buy the lowest airfares—has an onboarding that includes an account verification step. If done the wrong way, it could confuse and lose users. 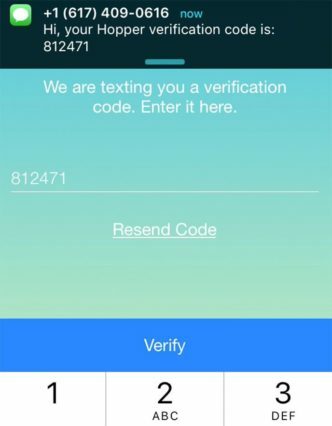 Instead of forcing the users to exit the app to check for a verification code, Hopper's code appears in an alert that keeps the user in the app. What's more, once the user dials in the verification code, a handy call to action button appears above the keyboard to continue the user's momentum. This concept by Filip Slováček is a new take on card design, which is pretty trendy right now. The background is almost empty space and each major design element is contrasted off of it. The stack of cards provide a depth of space, and the way the user can peek through at the screens behind it only adds to that depth. The progress marker at the bottom is another nice take at telling the user how many cards are in the stack. Jardson Almeida created this parallax effect in Principle, one of our favorite tools for prototyping more advanced animations and interactions. We love this interaction especially because it feels natural. The cards seem like physical, swipeable objects. Plus there's a wonderful depth added by the slight shadowing behind the cards and shoes, as well as the different speeds of each element as the user swipes from card to card. These wireframes by Phi Hoang use simple animations that aren't too distracting but pleasantly imply depth. The interactions between the map view, brief details, and full details work well together and maintain context throughout. 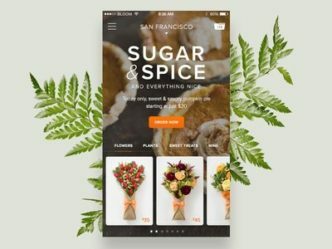 The v2.0 BloomThat app as a whole is just delightful. The photography is great, the onboarding is fun, and there are many little touches that while delightful, still help communicate information. The app onboards users using small animations above the keyboard to annotate where you are in the progress in a way we haven't seen before. It also uses a card layout that springs into a full screen view when selecting flowers. Dan Petty shared that it is one of his favorite designed apps to date. We even enjoy our experience outside of the app thanks to Bloom's informative yet fun marketing email messages. This tone is consistent throughout the user experience. We're always looking for—and sharing— new ways to approach app experiences. If you have work you’re either proud of or inspired by, share it with us on Twitter @savvyapps or by contacting us.